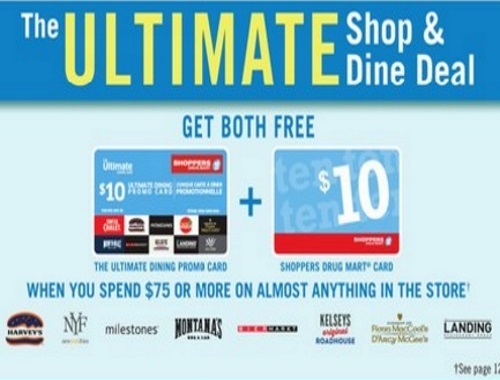 This weekend get the Ultimate Shop & Dine Deal at Shoppers Drug Mart! When you spend $75 or more on almost anything in the store get both a $10 Ultimate Dining Promo Card and $10 Shoppers Drug Mart gift card! One offer per transaction per customer. Offer is valid at participating Shoppers Drug Mart stores and while quantities last. Offer valid from Saturday, July 22, 2017 to Sunday, July 23, 2017. Click here to view the Shoppers e-flyer.